...when showing Jonathan the cute little sweater monkey outfit I found for Thomas from Gymboree. A entire sweater monkey post and photo is ahead in the future...but the sweater monkey outfit is still way too big for him at 0-3 months. It's more of a "swimming in a monkey outfit" right now. But trust me, it's really adorable in a Wee Ski sort of way. Jonathan (rolling his eyes): "What is it with monkeys?" Me: "I don't like your tone." Jonathan: "I'm afraid of monkeys." Jonathan: "I could be. They throw their feces at people." Oh my gosh...that totally cracked me up! I guess you'll be taking Thomas to the zoo to see the monkeys and not Jonathan!!! Glad you guys continue to do so well! Love all the photos of Thomas, his facial expressions and all that hair makes me smile! 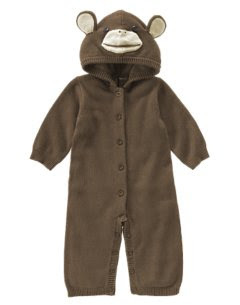 I'm going to make Jonathan a matching sweater monkey outfit for his birthday. You can thank me then. He won't be afraid when Thomas is wearing it! Though, be careful, because babies can do some pretty crazy things with feces.